The Thirty-Six Stratagems have variably been attributed to Sun Tzu from the Spring and Autumn period of China, or Zhuge Liang of the Three Kingdoms period, but neither are regarded as the true author by historians. Instead, the prevailing view is that the Thirty-Six Stratagems may have originated in both written and oral history, with many different versions compiled by different authors throughout Chinese history. Some stratagems reference occurrences in the time of Sun Bin, approx. 150 years after Sun Wu's death. The original hand-copied paperback that is the basis of the current version was believed to have been discovered in China's Shaanxi province, of an unknown date and author, and put into print by a local publisher in 1941. The Thirty-Six Stratagems only came to the public's attention after a review of it was published in the Chinese Communist Party's Guangming Daily newspaper on September 16, 1961. It was subsequently reprinted and distributed with growing popularity. The Thirty-Six Stratagems are divided into a preface, six chapters containing six stratagems each, and an afterword that was incomplete with missing text. The first three chapters generally describe tactics for use in advantageous situations, whereas the last three chapters contain stratagems that are more suitable for disadvantageous situations. The original text of the Thirty-Six Stratagems has a laconic style that is common to Classical Chinese. Each proverb is accompanied by a short comment, no longer than a sentence or two, that explains how said proverb is applicable to military tactics. These 36 Chinese proverbs are related to 36 battle scenarios in Chinese history and folklore, predominantly of the Warring States period and the Three Kingdoms Period. 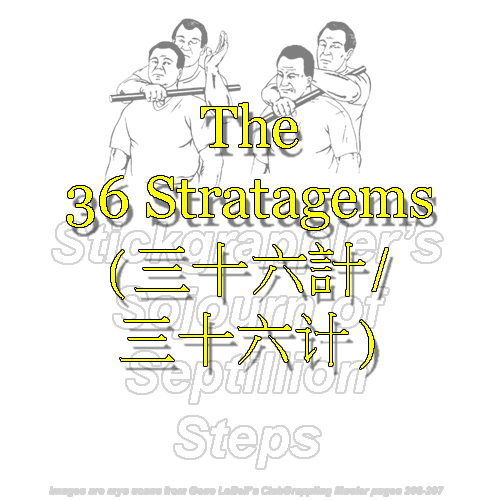 The Thirty-Six Stratagems consists of 6 chapters, each chapter consists of 6 stratagems. Mask your real goals, by using the ruse of a fake goal, until the real goal is achieved. Tactically, this is known as an 'open feint': in front of everyone, you point west, when your goal is actually in the east. When the enemy is too strong to be attacked directly, then attack something he holds dear. Know that he cannot be superior in all things. Somewhere there is a gap in the armour, a weakness that can be attacked instead. The idea here is to avoid a head-on battle with a strong enemy, and instead strike at his weakness elsewhere. This will force the strong enemy to retreat in order to support his weakness. Battling against the now tired and low-morale enemy will give a much higher chance of success. Attack using the strength of another (in a situation where using one's own strength is not favourable). Trick an ally into attacking him, bribe an official to turn traitor, or use the enemy's own strength against him. The idea here is to cause damage to the enemy by getting a third party to do the deed. It is an advantage to choose the time and place for battle. In this way you know when and where the battle will take place, while your enemy does not. Encourage your enemy to expend his energy in futile quests while you conserve your strength. When he is exhausted and confused, you attack with energy and purpose. The idea is to have your troops well-prepared for battle, in the same time that the enemy is rushing to fight against you. This will give your troops a huge advantage in the upcoming battle, of which you will get to select the time and place. In any battle the element of surprise can provide an overwhelming advantage. Even when face to face with an enemy, surprise can still be employed by attacking where he least expects it. To do this you must create an expectation in the enemy's mind through the use of a feint. The idea here is to get the enemy to focus his forces in a location, and then attack elsewhere which would be weakly defended. How to deal with an opponent who is openly your enemy. A plain lie. Make somebody believe there was something when there is in fact nothing. One method of using this strategy is to create an illusion of something's existence, while it does not exist. Another method is to create an illusion that something does not exist, while it does. Deceive the enemy with an obvious approach that will take a very long time, while surprising him by taking a shortcut and sneak up to him. As the enemy concentrates on the decoy, he will miss you sneaking up to him. This tactic is an extension of the "Make a sound in the east, then strike in the west" tactic. But instead of simply spreading misinformation to draw the enemy's attention, physical baits are used to increase the enemy's certainty on the misinformation. These baits must be easily seen by the enemy, to ensure that they draw the enemy's attention. At the same time, the baits must act as if they are meant to do what they were falsely doing, to avoid drawing the enemy's suspicion. In the present day, "sneak through the passage of Chencang" also has the meaning of having an affair or doing something that is illegal. Delay entering the field of battle until all the other players have become exhausted fighting amongst themselves. Then go in at full strength and pick up the pieces. Charm and ingratiate yourself with your enemy. When you have gained his trust, move against him in secret. Do something unaimed, but spectacular ("hitting the grass") to provoke a response of the enemy ("startle the snake"), thereby giving away his plans or position, or just taunt him. Do something unusual, strange, and unexpected as this will arouse the enemy's suspicion and disrupt his thinking. More widely used as "[Do not] startle the snake by hitting the grass". An imprudent act will give your position or intentions away to the enemy. Take an institution, a technology, a method, or even an ideology that has been forgotten or discarded and appropriate it for your own purpose. Revive something from the past by giving it a new purpose or bring to life old ideas, customs, or traditions and reinterpret them to fit your purposes. If the enemy's army is strong but is allied to the commander only by money, superstition or threats, then take aim at the leader. If the commander falls the rest of the army will disperse or come over to your side. If, however, they are allied to the leader through loyalty then beware, the army can continue to fight on after his death out of vengeance. Take out the leading argument or asset of someone; "steal someone's thunder". This is the very essence of indirect approach: instead of attacking enemy's fighting forces, the attacks are directed against his ability to wage war. Literally, take the fuel out of the fire. Create confusion and use this confusion to further your own goals. Mask yourself. Either leave one's distinctive traits behind, thus becoming inconspicuous, or masquerade as something or someone else. This strategy is mainly used to escape from enemy of superior strength. To capture your enemy, or more generally in fighting wars, to deliver the final blow to your enemy, you must plan prudently if you want to succeed. Do not rush into action. Before you "move in for the kill", first cut off your enemy's escape routes, and cut off any routes through which outside help can reach them. Invading nations that border your own territory has a higher chance of success. The battle fields are close to your own country, thus it is easier for your troops to get supply and to defend the conquered land. Make allies with nations far away from you, as it is unwise to invade them. With baits and deceptions, lure your enemy into treacherous terrain. Then cut off his lines of communication and avenue of escape. To save himself, he must fight both your own forces and the elements of nature. Tying silk blossoms on a dead tree gives the illusion that the tree is healthy. Through the use of artifice and disguise, make something of no value appear valuable; of no threat appear dangerous; of no use appear useful. Usurp leadership in a situation where you are normally subordinate. Infiltrate your target. Initially, pretend to be a guest to be accepted, but develop from inside and become the owner later. Send your enemy beautiful women to cause discord within his camp. This strategy can work on three levels. First, the ruler becomes so enamoured with the beauty that he neglects his duties and allows his vigilance to wane. Second, the group of men will begin to have issues if the desired women courts another man, thus creating conflict and aggressive behavior. Third, other females at court, motivated by jealousy and envy, begin to plot intrigues further exacerbating the situation. When the enemy is superior in numbers and your situation is such that you expect to be overrun at any moment, then drop all pretense of military preparedness, act calmly and taunt the enemy, so that the enemy will think you have a huge ambush hidden for them. It works best by acting calm and at ease when your enemy expects you to be tense. This ploy is only successful if in most cases you do have a powerful hidden force and only sparsely use the empty fort strategy. Undermine your enemy's ability to fight by secretly causing discord between him and his friends, allies, advisors, family, commanders, soldiers, and population. While he is preoccupied settling internal disputes, his ability to attack or defend is compromised. Pretending to be injured has two possible applications. In the first, the enemy is lulled into relaxing his guard since he no longer considers you to be an immediate threat. The second is a way of ingratiating yourself with your enemy by pretending the injury was caused by a mutual enemy. In important matters, one should use several stratagems applied simultaneously after another as in a chain of stratagems. Keep different plans operating in an overall scheme; however, in this manner if any one strategy fails, then the chain breaks and the whole scheme fails. If it becomes obvious that your current course of action will lead to defeat, then retreat and regroup. When your side is losing, there are only three choices remaining: surrender, compromise, or escape. Surrender is complete defeat, compromise is half defeat, but escape is not defeat. As long as you are not defeated, you still have a chance. This is the most famous of the stratagems, immortalized in the form of a Chinese idiom: "Of the Thirty-Six Stratagems, fleeing is best" (三十六計，走为上計). By now, I'm sure you have heard about the United Airlines passenger that was dragged off his flight against his will. 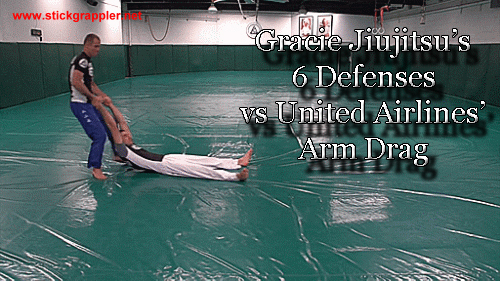 Props to Rener and Ryron Gracie for their Gracie breakdown which included 6 defenses from Gracie Jiujitsu vs the Arm Drag. I took the liberty to make 14 animated GIFs of the techniques. Without further ado, below are 14 GIFs I've made of the realtime as well as slowmo speed of the techniques.